FinderPop 2.5.7 "Autumnal Equinox" released Saturday 27 September 2014.
unless System Integrity Protection (aka "Rootless Mode") is disabled. For normal users, I would not recommend disabling SIP, though it is possible to disable it and get FinderPop to (mostly) work. It is highly likely that this will never be satisfactorily resolved because FinderPop relies on OS features which, when SIP is enabled, have deliberately been removed by Apple with the aim of increasing system stability. See also discussion of how to disable SIP and the reasons for doing so - or not doing so - at binaryage.com, makers of TotalFinder, a cool Finder enhancer. I'm in the "old school" of "Hey, it's my computer, I get to choose what runs on it!" FinderPop Works on PowerPC 10.4/10.5, and Intel 10.4/10.5, almost everything works on Intel 10.6/10.7/10.8/10.9/10.10. Numerous other bugfixes and a couple of new features - see this forum post and the Release Notes and the Hints & Tips sections of the Book Of Words. Patrick Welker of RocketInk.net has created a smashing 3-minute YouTube video which introduces FinderPop - well worth a look. FinderPop is free, but if you really like it you can get me a pint: PayPal or Kagi. Ensure you use the Apple unzipper to unzip the downloaded FinderPop zip file. Then, if the System Preferences application is running, please quit it. Strange things can happen otherwise. Double-click the FinderPop.prefpane icon you downloaded. System Preferences will open and ask if you want to install FinderPop for all users or just you. If you are using 10.7 or later, or are using FileVault, you should choose 'All Users'. Otherwise you can choose either option, and the System will install the FinderPop Preference Pane. FinderPop may ask you for the admin password in order to set certain permissions on some FinderPop files. This is only done once at installation time. If you had an older version of FinderPop already installed, you will have to logout to begin using the new version. After installation, open the FinderPop Preferences Pane. Click on the "Items" tab, then on the "Show FinderPop Items" button. You'll be switched to the Finder with a folder called "FinderPop Items" showing. Add aliases to your favourite apps/folders/disks/documents to this "FinderPop Items" folder. Next time you control-click, the items you added will be part of your contextual menu! Additionally, click a blank portion of the menubar anytime to have instant access to these items and more. While browsing FinderPop menus, pressing Command-Option will display a "Get Info" help tag, pressing Cmd-Opt-Control will allow you to move the selected item to the trash, and pressing Command while selecting an item will reveal that item in the Finder. Also, pressing 'i' will immediately show the Finder Info window for the item, 'r' will immediately reveal the item, 'q' will QuickLook it (Leopard only), 'g' will "grab" or "pick up" the item and allow you to drag it around (as with all Mac drags, dragging to the menubar and letting go aborts the drag.) Pressing Tab will bring up a "FinderPop Info" window on the item. 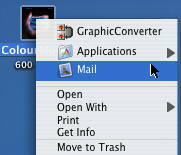 Other features: Command-control-click a folder to get a Contents popup menu. Shift-click an unused portion of the menubar to see a Desktop menu with your mounted disks and items on your desktop. Command-click an unused portion of the menubar to see a Processes menu. If Control is down as well, background-only processes will also be shown in the Processes menu. Press Command-Option-Control to kill a process. There is also the FinderPop Support Forum, where if I can't answer your questions, someone else will! FinderPop 2.5.6, Universal, 10.4 - 10.9), 2000K zip. FinderPop 2.5.5, Universal, 10.4 - 10.9), 2000K zip. FinderPop 2.5.1, Universal, 10.4 - 10.9), 1950K zip. FinderPop 2.5, Universal, 10.4 - 10.9), 1950K zip. FinderPop 2.4.9, Universal, 10.4 - 10.8), 1950K zip. FinderPop 2.4.6, Universal, 10.4 - 10.8), 1850K zip. FinderPop 2.4.4, Universal, 10.4 - 10.8), 1850K zip. FinderPop 2.4.1, Universal, 10.4 - 10.7), 1800K zip. FinderPop 2.4, Universal, 10.4 - 10.7), 1800K zip. FinderPop 2.3, Universal, 10.4 - 10.6 (not 10.7), 1500K zip. FinderPop 2.1.0, Universal, English, 10.4/10.5. 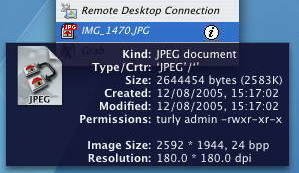 Base 2.1 version (27-Feb-2008). Japanese 2.0.1 by Osamu Satoh (575K zip, updated localisation on 23 September 2007.) Also available at Osamu's website. The really ancient FinderPop page (1999 vintage) is here. 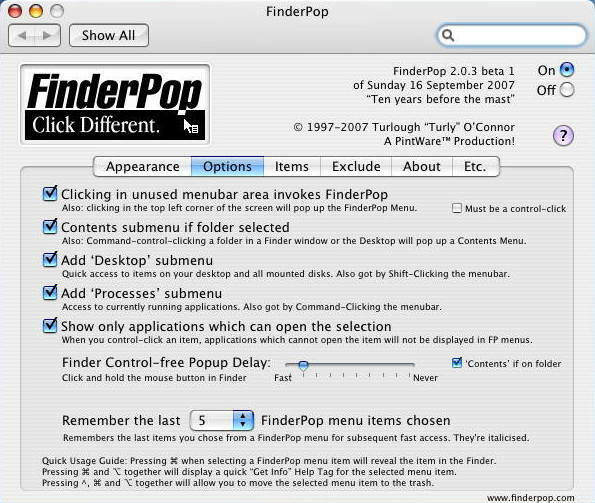 FinderPop 1.9.2 for MacOS 8/9 is available there. FinderPop would have been impossible very very difficult indeed without the pioneering work of Jonathan "Wolf" Rentzsch, Bob Ippolito and Bertrand Guihéneuf. Many thanks to them. Also much thanks are due to Rosyna and Unsanity for sharing their patching mechanism. I play with Google Plus every now and then. The FinderPop Beer Quotes Page has all of FinderPop's Vaguely Beer-Related Aphorisms collected in one handy webpage. Enjoy! www.finderpop.com last updated by turly Thursdau 01 October 2015.